It's an analysis of competing fundamentalisms in Christianity, Islam, and Hinduism. 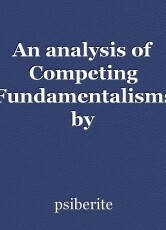 Christian Fundamentalism was a reaction against secular world view. Under the New Christian Right NCR, evangelists used digital and social media. After September 11, Christian fundamentalism grew its claws to claim American Society.